Save money on a DJI Mavic Pro drone by purchasing a DJI refurbished unit from Commercial Drones. 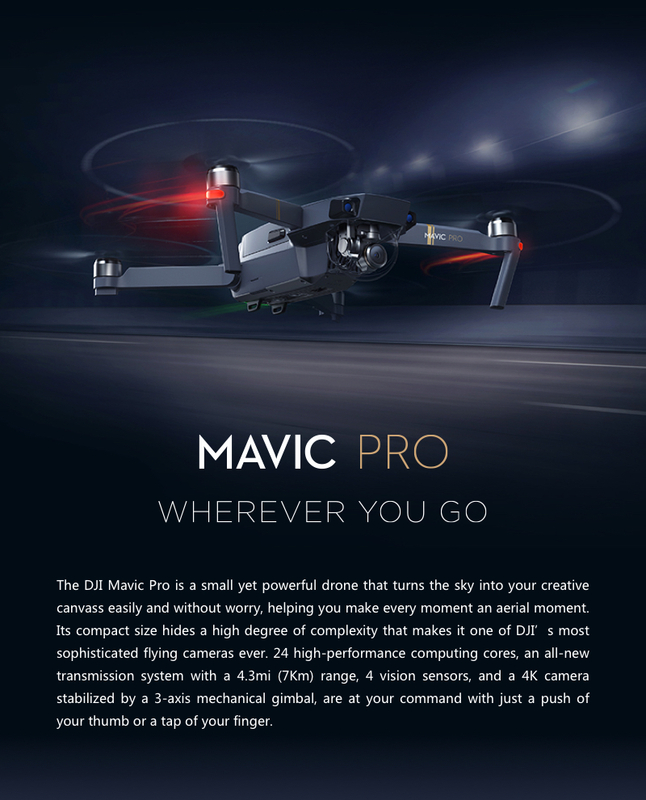 A refurbished Mavic Pro is just like the original, except that it has been returned to DJI by the original owner. It has the 4K ultra-high-definition camera, a 3-axis gimbal to stabilize video, and the foldable, compact form that makes it highly portable. There may have been an issue, but just as likely it simply wasn’t what the buyer expected or wanted. DJI technicians go over every returned unit for defects and make sure it’s operating properly. Any defects that are found are corrected, and the unit is thoroughly tested before it’s issued a new serial number and placed in a box for shipment. 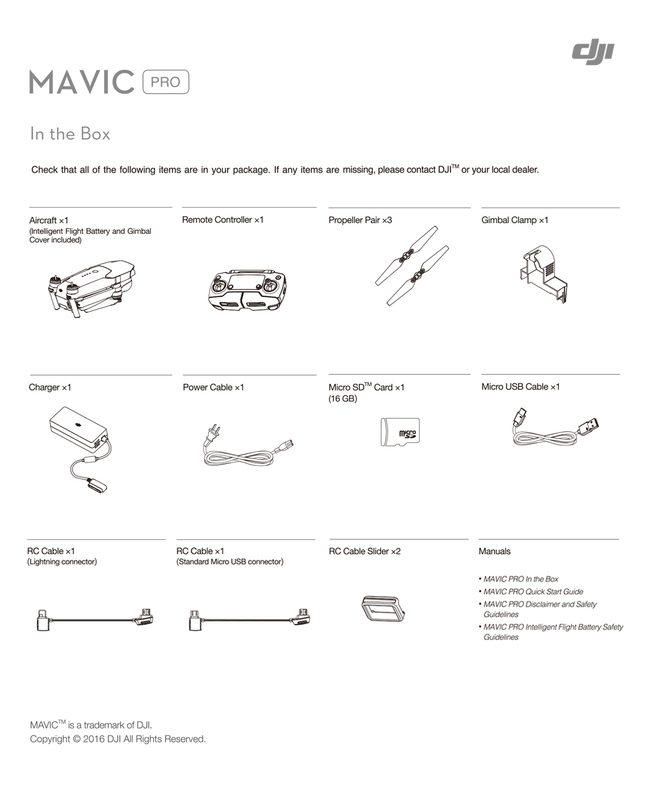 A refurbished Mavic Pro isn’t shipped until it’s ready to be — after problems are fixed and it’s tested. It receives its own serial number ending in “R.” Everything you would get with a new Mavic Pro comes with the refurbished unit: the drone, three pairs of propellers, a gimbal clamp, a charger, a charger cable, one 16GB Micro SD card, a micro USB cable, an RC cable Lightning connector, an RC cable with standard micro USB connector, two cable sliders and all manuals. It carries a performance warranty identical to that of the new Mavic Pro, except for the exchange policy. A refurbished DJI Mavic Pro can be returned within 7 days for any reason, just like a brand-new Mavic Pro. The exchange policy has one difference: A refurbished unit can be exchanged only for another refurbished product, not for a new product. Do you have three minutes — at most? Unfold the four arms and click them into place. (First flight? You’ll have to snap on the upper propellers; they’ll stay there, even for storage.) Snap your smartphone onto the handheld remote controller, and hit the power button. After calibrating the compass, which is a cinch, you’re ready to take off. When you place your drone on a flat surface and start the motors, the propellers will unfold automatically. Your smartphone attaches to the pocket-sized remote controller in seconds without a cable. Fold-out arms on the remote controller hold it in place. If you want to fly with your smartphone only, just download an app that lets you. Positioning is made reliable by dual IMUs and compasses on the Mavic Pro. Your Mavic has GPS, GLONASS and ultrasonic range finders. Each key sensor on the Mavic Pro is duplicated. If one sensor fails, the backup sensor takes over. Get where you’re going and back to base without losing control. Obstacles as close as 2 feet are picked up by visual sensors when flying slowly, and so are items as far away as 49 feet at speeds up to 22 mph. Sensing an obstacle, your Mavic Pro will stop and hover until you send a command. It uses its vision sensors to see in three dimensions and protect you from unexpected dangers, even if it’s 14 feet off the ground and even if its GPS signals are blocked by trees. You’re the pilot, and Flight Autonomy is your first officer, giving you and your drone all the information needed for a successful flight. Hover precisely and land almost exactly where you took off with Flight Autonomy. Precision Landing senses an uneven landing site. Use TapFly onscreen to redirect Mavic Pro. Rely on Terrain Follow to safely maintain position off the ground, even while following a subject on a road or trail with changing terrain. Safe Return to Home avoids obstacles as Mavic Pro heads back to base; it switches on automatically if your battery runs low..
See what your camera sees from up to 4.3 miles away. DJI Go tells you everything you need to know onscreen — your location, altitude, battery reserve, and what’s in front of you. Mavic Pro streams a hi-def view using OcuSync. It streams in 1080p when your drone is nearby, and 720p when it’s farther away — up to 4.3 miles. All the while, your Mavic records in detailed 4K. To become fully immersed in the flying experience, get optional DJI FPV Goggles. They connect wirelessly with Mavic Pro. Control the drone and camera with taps on one side of the goggles, or control the drone by head movements. Share the flight experience by letting a friend wear the goggles while you fly your Mavic by the remote controller. You can also use OcuSync to download video and stills while recording additional images. If you encounter interference, OcuSync chooses the best frequency available. Aerial video recorded in 4K has four times the pixels of 1080p. The Mavic Pro captures 4K video at up to 30fps, steadied by a 3-axis gimbal. Mavic Pro uses ActiveTrack to lock onto your subject, including when you’re the subject. Trace — Your Mavic Pro will follow in front of or behind your subject. If you want, it will also circle your subject. At a wedding, Trace flies backwards and level, focusing on the bride and groom as they leave the chapel. There’s no need to bend low or walk backwards. Profile — Fly beside a subject who is hiking an uneven trail, paddling a canoe or exploring a historical site. Spotlight —Lock on a stationary subject and get adventurous. As you fly in any direction in search of the best angles, your subject stays in the frame and in focus. Tripod — Slow your drone with Tripod. It delivers measured, deliberate moves to help you discover and record every nuance of your scene. Mavic Pro can read the hand gestures your learn to signal it to shoot a selfie. Mavic Pro will wait three seconds while you pose, then snap the photo. Mavic promotes creativity. Shooting can be automatic or manual, with you setting aperture, shutter speed, ISO and file format onscreen. Mavic Pro includes a 16MB video card; you can buy up to 64 GB of storage capacity separately. Mavic Pro can fly in real-world conditions for about 21 minutes on a battery charge — not just 10 or 15 typical of small drones. It’s powered by a quick-charge 3S Intelligent Flight Battery, which you can buy so there’s always a charged battery or two on hand. The battery guards from overcharging and from excessively discharging during storage. It will communicate onscreen just how much power is left. Extra batteries and a multi-battery charger are available from Commercial Drones so you can stay in the air longer and spend less time on the ground. If you don’t want to wait to share your video, stream live to Facebook or YouTube. Or edit it first and fast with the DJI Go Editor on your smartphone. For more professional editing, download video to your computer and edit there. Then share your video on Twitter, Instagram or SkyPixel, the DJI community. For stills with a real professional look, shoot in Adobe DNG RAW, which will let you get the most out of every pixel while editing on your computer. Since the Mavic Pro weighs only 1.6 pounds, the setup creates no fatigue. When you want to return to the air, just reverse the process. It takes only minutes. You can also buy the Katana Handheld Stabilizer separately . To help you deal with any kind of ambient light, there are PolarPro Mavic lens filters. Filters are available in packs of six or packs of three. Charge up to four DJI Mavic pro Intelligent Flight Batteries at a time with a charging hub. The hub is smart, too, charging the battery with the highest power level first so you’re ready to fly sooner. With a car charger, you can replenish a battery on the way to a shoot.